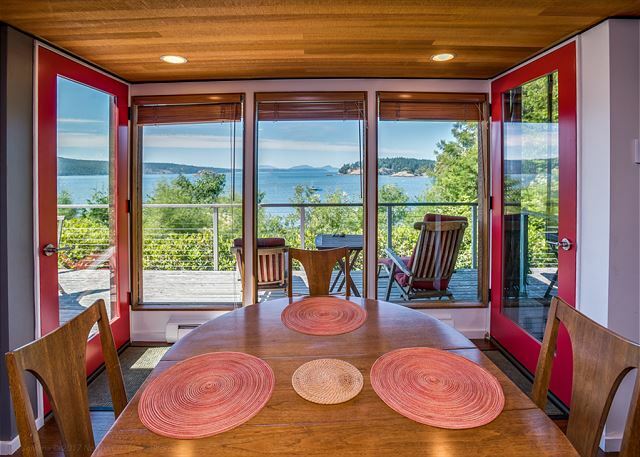 Part of the beautiful wrap around deck that allows you to enjoy the views. The living room area has modern couches and beautiful design. A high ceiling with a large TV and splendid views. The kitchen is a few steps up from the living room. 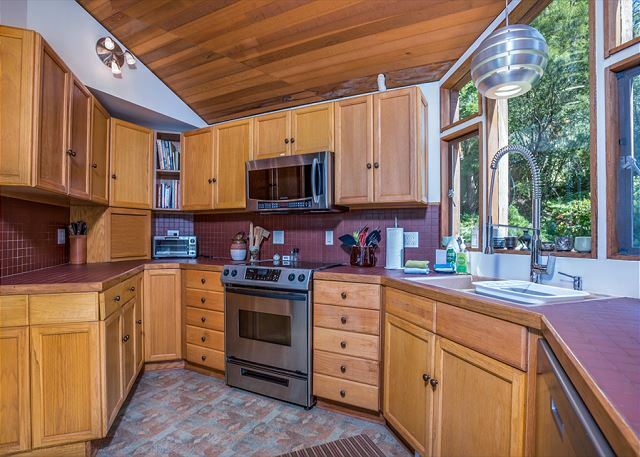 The kitchen has a fantastic garden view and is well appointed with modern appliances. Ample counter space and a large sink offer plenty of space for meal creation. The first floor bathroom is well equipped. Back into the main area of the house, the dining area has amazing views. The dining area looking back into the home. Large windows ensure you don't miss any of the view during your stay. The deck off the living and dining room. The views continue from the Master Bedroom. A second view of the master bedroom. Heading upstairs there is a cute guest bedroom with queen size bed. In the guest room looking toward the bathroom. A view of the beautiful bedroom art work. The upstairs bathroom is cute and well equipped. The bed in third floor loft. A view from the loft writing desk. A front row seat to enjoy the view out to Sea. Thank you for considering Tranquility Base. 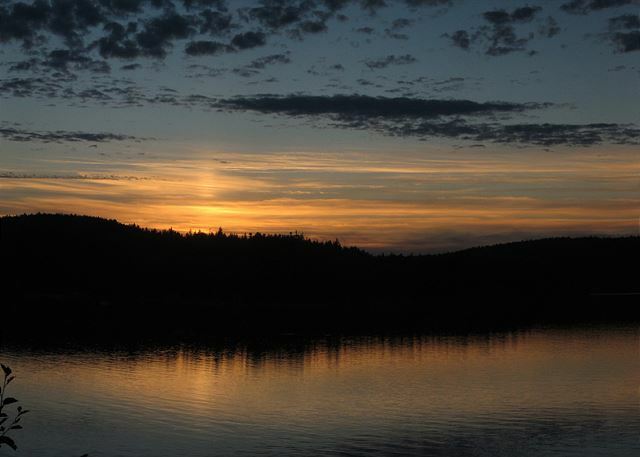 This is a special home in a special place, and the sunset over the ridge is hard to beat. An eagle on a snag. 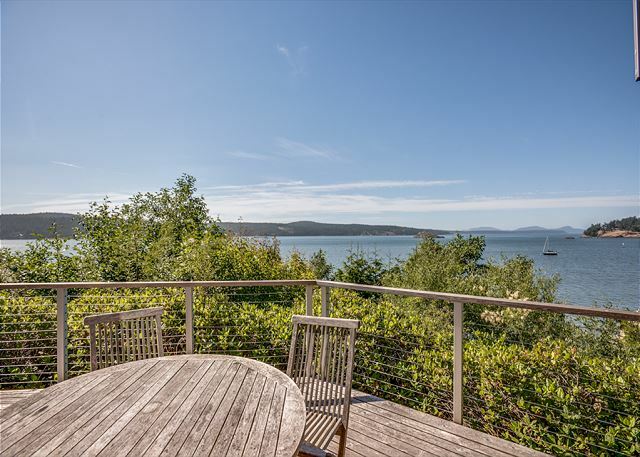 The term quintessential is often over-applied to the descriptions of romantic lodging in the San Juan Islands, but when it comes to Tranquility Base, it is simply appropriate. 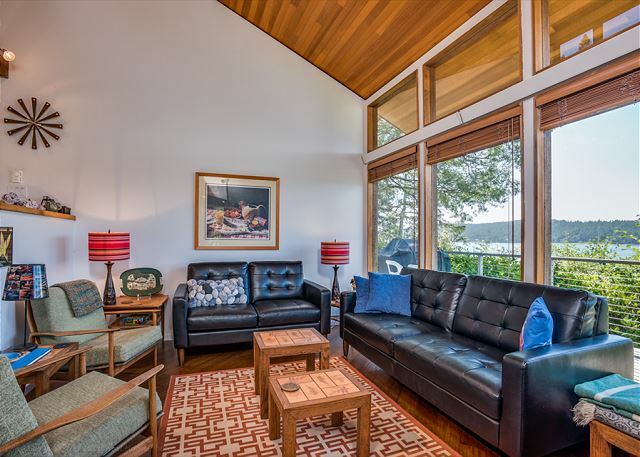 When you imagine a solitary retreat, time away with a special someone, or a small family vacation, this wood-shingled bungalow is likely just what you have in mind. 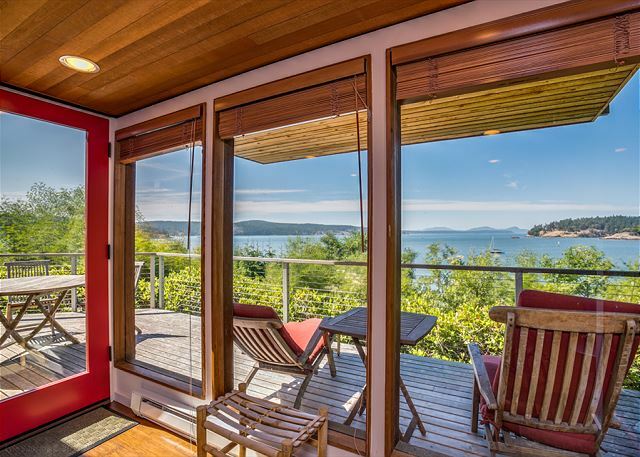 Tranquility Base is tucked away on the quiet south end of Lopez Island, perched over a cobalt blue bay. 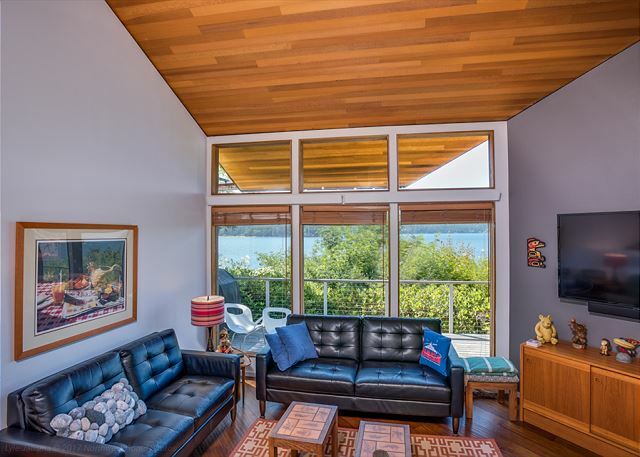 The setting is quite private, naturally landscaped, and focused on the gorgeous expanse of water that opens to the channel in the distance and the setting sun as it drops over the island. 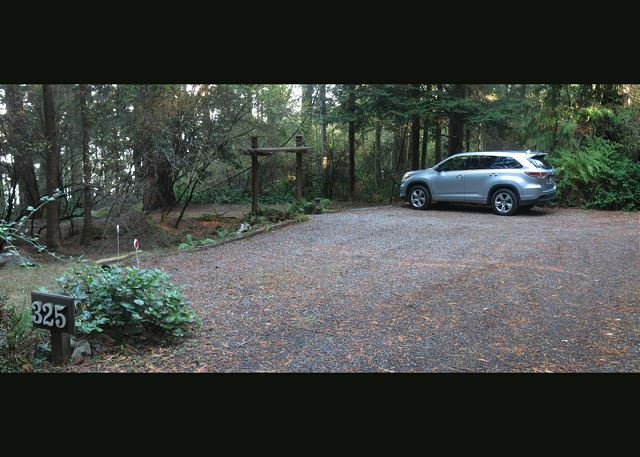 There is beach access from the property and alternate beach access is available by continuing down Sperry Road approximately three tenths of a mile to a public boat launch area. The home was recently remodeled and the rich new wall colors and contemporary furnishings are a compliment to its essential;y cabin character.. The tasteful styling also has touches of personal design whimsy that will be a delightful surprise when you arrive. The rooms are placed on multiple levels with the kitchen, living, and dining areas on the main level. The kitchen is well equipped, opens to the newly expanded deck, and offers a breakfast bar overlooking the living room. The dining area is across the living room and also opens to the deck. A bathroom with shower is located on this main level as well. 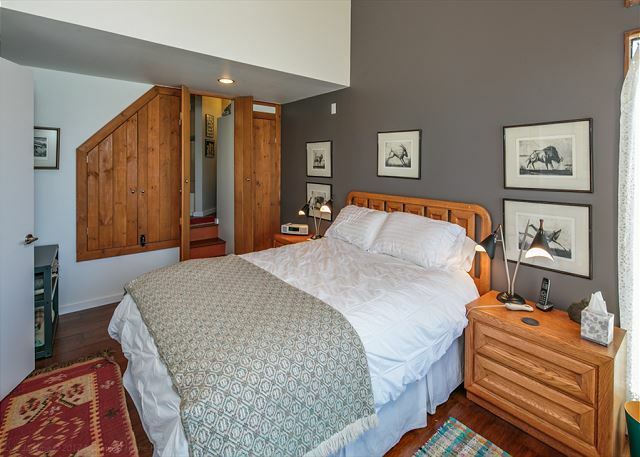 On the middle level, there are two cozy bedrooms, each with a new queen size bed. Each bedroom opens to a shared bathroom with a tub/shower. One might also restrict use to one of the bedrooms to create an en-suite master bath. 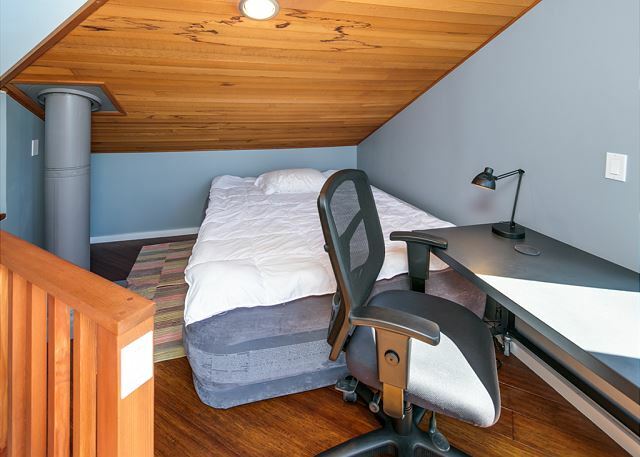 A small loft with low dormer ceilings on the third level contains a comfy queen size/full height aerobed that would be suitable for a teen or single adult. The stair railings and other construction elements within the home make this property unsuitable for children under 8 years of age. 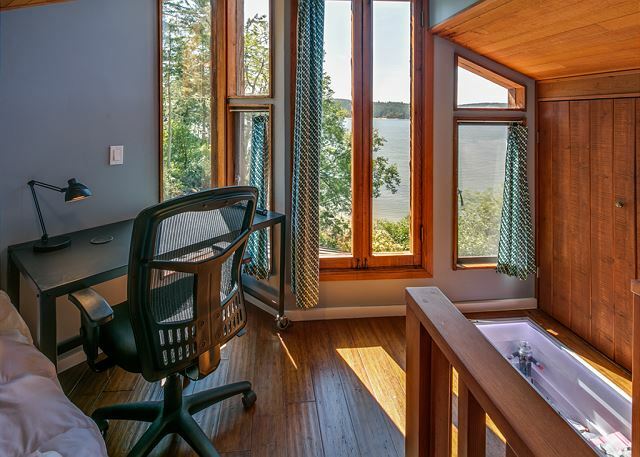 Fans of film and audiophiles will not feel adrift in this cabin by the beach because there is a BluRay DVD system, ROKU for streaming HBO-GO, Amazon Prime, Netflix, and an iPod input to the TV sound system. Those less technology inclined may also enjoy the retro phonograph/CD/Radio. A fantastic view coupled by a charming cabin made for a great stay! We enjoyed the house. It had lots of natural light even on a rainy weekend, and was spacious. The kitchen was well-stocked with tools for us to cook meals for four. The bedrooms are situated to where there is little noise heard from one to the other. 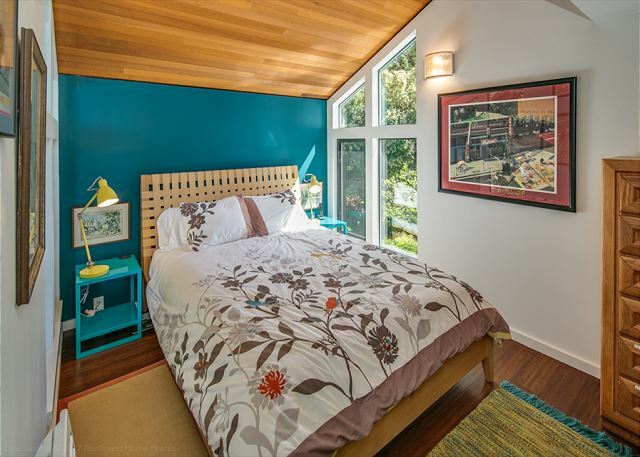 We enjoyed the mid-century design flair in the house! We needed respite from the world for a week and found this spot was just what we needed. We cooked or barbecued every night and hiked each day. 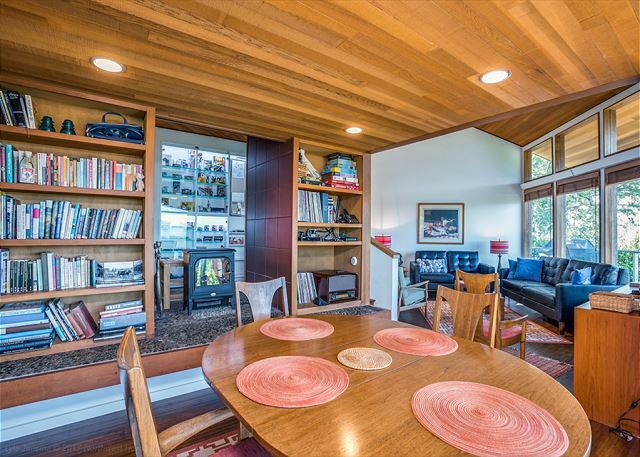 Stunning mid century feel to the home that has a beautiful layout. Played cards on the dining room table with the sunset over the water. 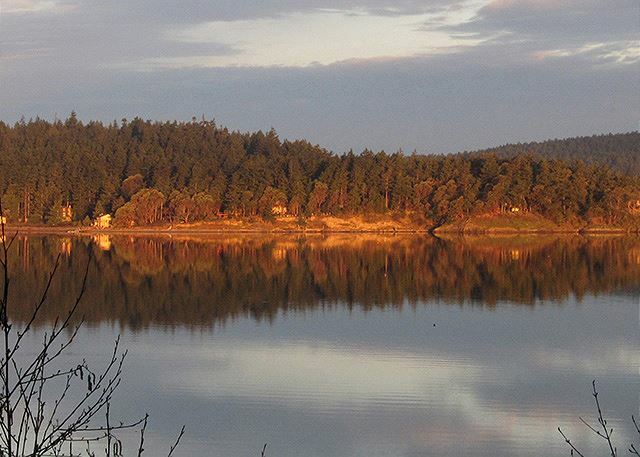 Lopez has gentle hiking trails with far fewer tourists to really quiet your mind and take in the splendor. Thank you..
My family and I had a fantastic time staying at tranquility base. It was such a cool house with so many neat collectibles. The view was stunning. The island itself is amazing. We saw so much wildlife. We would love to come back. There are no stairs, and no sign of any being built in the near future. It was everything we hoped for. We had peace, quiet and adventures. This is a beautifully designed house with lots of great touches and a great peaceful view. Good for solo travelers looking for R&R or couples (or a family). Out of the way but close to the Southend Store, which has good provisions and a surprisingly good restaurant. We just returned from a 4 night stay at Tranquility Base #321 and couldn't be happier. The house itself was wonderful, a real piece of art, with a wonderful feel and layout. The owners supplied much more than what was needed, especially in the kitchen. The view from the house and numerous decks were fabulous, especially at sunset. 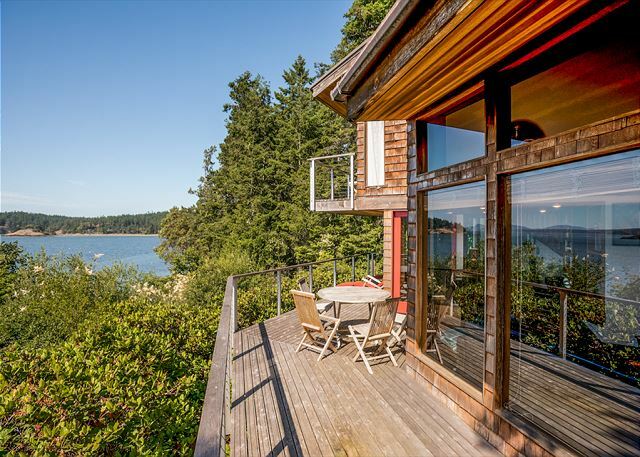 The house is located in southeast Lopez Island, which is quite beautiful and very private. We loved kayaking in the protected bay in front of the house. We saw lots of wildlife in the bay, including otters, harbor seals, eagles and osprey. We have rented numerous vacation homes in the past. This house is our favorite. The cabin and its location was an amazing home away from home. From the breathtaking views in the morning to the beautiful sunsets, to everything one would need to be more than comfortable, there was no need to go anywhere on the island. The pictures don't do this place justice! It's wonderful & I'm picky, picky, picky. 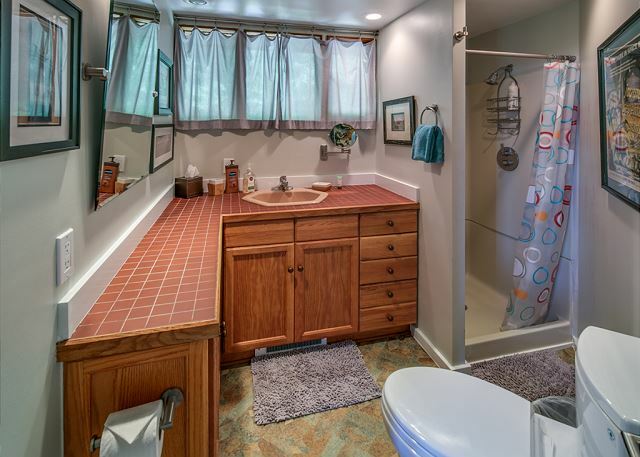 Fresh clean linens, beautiful ceramics, well appointed household goods, clean tub. And the home and location are simply spectacular! Highly recommend! Wonderful experience. Incredible views. Perfect location and size for a small family. The location was exactly as I imagined! The house was fully equipped and inviting. I had no disturbances from neighbors. The deer, eagles and otters were all lovely! We really enjoyed our stay at this lovely cliffside abode! It was quiet, comfortable and homey with lovely large windows that let in the light and sights of the San Juan's, like eagles, dragon flies, bats and amazing sunsets! The deck was a real treat and we loved the open floor plan which allowed mingling while in the kitchen / living room / dining area etc. It was a happy surprise to get to enjoy the robust vintage science fiction collection as well, my husband really got a kick out of perusing all of these artifacts. Very comfortable with great amenities, and a great guidebook put together by the owners of the property! One suggestion: It would be great to have a small bench or seat inside / near the front door to sit and remove your shoes or perhaps stow them. And I would also point out that there are many stairs in the house, so if this is a problem for anyone in your party I would recommend finding a single level house. Overall it was a wonderful experience and we'd love to come back and stay again! The neighborhood is quiet and peaceful and we could still get to the hustle and bustle of the main town with ease! Thank you for sharing your fantastic and special home with us! Beautiful, well-stocked and extremely comfortable house with a fabulous view. Quiet and private. Perfect for relaxing. House was immaculate with everything we needed for a wonderful vacation. I cannot recommend this rental house more strongly. Fantastic house! Nesting eagles came with the rental. Every possible wish or need was anticipated and provided. Cook's kitchen. Unique design with great collections. Very tranquil and rejuvenating location. Water view and beach access at low tide. Great t.v., internet access, and invitation to use landline freely for US calls. Three negatives: lots of mosquitoes at dusk and dawn, cell signal only at end of Mud Bay Road by the Microsoft guy's compound, and distance from the ferry. One other highlight - owners left manual of recommendations for the island and they were great experiences that revealed the hidden beauty of the island, like Watmough Bay hike and the Shark Reef Sanctuary where we watched harbor seals teaching their babies to hunt for fish for hours. We also enjoyed the Farmer's Market on Saturday, getting to meet the colorful locals like the woman who told us she was an elf when we bought a card with a gnome on it. We're so happy to hear about your wonderful experiences on Lopez and in this very special home. A pointer for future renters is that altho Verizon cell coverage is minimal (and spotty overall throughout the San Juan's), AT&T cell coverage is quite good on the beach and at Tranquility Base. We stayed at Tranquility over the Fourth, 2014. There were five in our party and we were very comfortable. The house is beautiful and very well appointed. Plenty of high quality towels, great linens and dishes, etc. The beds were very nice. 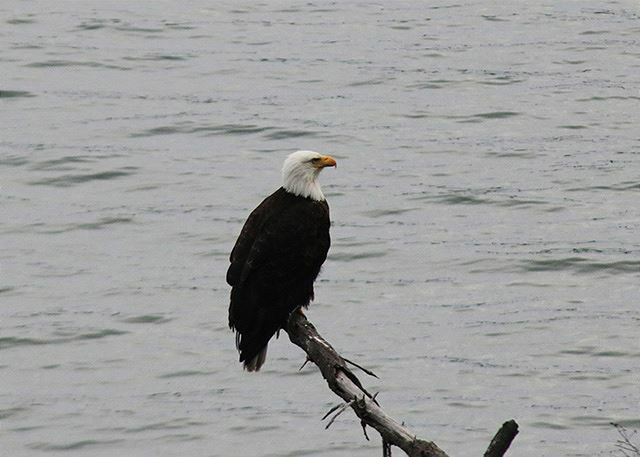 There were a pair of eagles patrolling the area off the back deck, and otters and seals in the water. Hummingbirds checked in on us throughout the day and deer stopped by in the morning. We cooked in the home most evenings and enjoyed the sunset off the back deck. We found the village grocery store very well stocked. We took a whale watching tour from the Islander resort and saw the local Orca pods. Our vacation was quiet and relaxing, just what we were looking for.